Travel back to a simpler time when teens gathered at the local soda shop and listened to the Juke Box. Click here to play! If you can fit in during the 1950s, at the height of the Space Race, you'll see yourself spinning in plenty of green for your wallet! Everyone is space crazy in the Atomic Age, so look to the reels for a chance sighting of the alien space ship. This unidentified flying symbol is a wild. Not only will it get you up to 7500 times your line bet, but will also substitute for most other symbols to help you create more wins. Watch three to five rocket ships launching into the sky and get up to 500 times your line bet. Atoms will bring in the same. If you can spot three to five orbiting satellites on these reels, you'll get up to 250 times your line bet. Television sets will get you 200 times your line bet, as do record players. Also take in all of the classics of the 1950s such as soda pop, milk shakes and Jell-O for even more chances to win. Of course it wouldn't be the 1950s without the beautiful classic cars. Spin three to five pink Cadilliacs and you'll trigger a bonus round. Three to five cash registers will also trigger a bonus round. Each will give you even more chances to win. 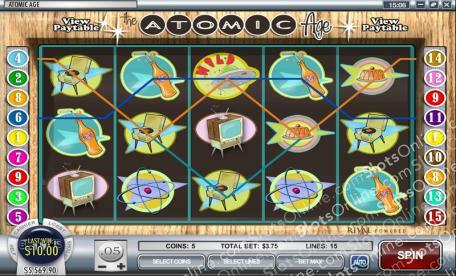 Relive the excitement of the 1950s in the Atomic Age and you could bring in plenty of big wins! The alien space ship acts as a wild. If you spin two to five of them across an active pay line and you'll get up to 7500 times your line bet. It will also substitute for all other symbols (excluding bonuses) to create more wins. There are two bonus symbols in this slot game. The first is activated when you spin three ore more Pink Caddies anywhere on the board. It's the Movie Night feature in which you will be prompted to create the perfect date by choosing a date and a movie. The success of your date will determine your bonus prize. The second is triggered when you spin three or more cash registers anywhere on the board. During the Register Roundup you will choose three items from the shelf that you believe will add up to $1.50. How close you get determines your prize.